I'm so grateful to all of you. It's the first time I've sold a house and the process is a bit scary to the uninitiated! You've all made it a lot less stressful and I'm very thankful. Hi Lorraine I have had confirmation of my mortgage from Halifax I thank you all for your efforts over the last month to push this through for me it is greatly appreciated!! Good Afternoon Gail We would like to express our sincere gratitude to Geoffrey Lurie Solicitors for all their hard work on the purchase of my mother-in-law’s property. A huge thank you to Gail. Your professionalism experience, and speed was exemplary, and we wouldn’t hesitate to recommend you and your firm. Hi James I received your letter yesterday. I will take your recommendation and accept the offer less your legal costs. Thanks for sorting this out for me. Really appreciate your effort. A quick line to say thanks for the hard work that you put in this week to the contract exchange on Monday and the completion on Friday. I couldn't have asked for more dedication to getting them done on schedule. It confirms that I will be very please to recommend Amanda Lipman and Geoffrey Lurie for conveyancing work in the future. We feel that we were given excellent value for money we will be using the company again for our new purchase. Dear Gail Thanks to you and Gail Howe for the excellent service you gave us during our recent property sale and purchase. You were both always calm and reassuring during what could have been a stressful time and we are extremely grateful. After your exemplary service in our most recent purchase , we would like to accept your quotation for the sale of our current property as we have now accepted an offer of £70,000. Just wanted to thank all the ladies at Geoffrey Lurie, especially Gail. They were there for me at every possible moment of the house sale. Thank you! They saved the day for me and got me moved in on my specified date. Very good and helpful, answered all my questions and very professional but also great value. Hi Lorraine, Just a special thanks for everything that you did for us and our new home! Amazing from start to finish! Dear Amanda, Thanks you so much for your professional support and understanding over the past few years with Northumbria Water & the Evironmental Agency. Not an easy task! We really appreciate how efficient and well you have handled everything. We will definitely be back in touch should we have anything further that we require your help with in the future. Hi Gail, I just wanted to say thank you for all of your help in the sale of my property.You were very quick to send out any paperwork I needed to complete and easy to get hold of by telephone if I had any questions at all. I appreciate you pushing the buyer's solicitor when they were dragging their heels and getting the completion through in a short time frame. Once again thank you! Thank you so much Lorraine for all your work ,help , and advice all very much appreciated. As soon as Dean gets a buyer for his house we will be in touch! Hi James, Many thanks for taking the time to help us and for your exceptional warmth and empathy. A huge thank you to Gail. Your professionalism experience, and speed was exemplary, and we wouldn’t hesitate to recommend you and your firm. I would like to thank you again for all your help and support it has been very much appreciated. Hi Lorraine Thanks very much for all the time and effort you put into my house sale. It seemed very seamless so very much appreciated. Dear Lorraine, Thanks again for the good service you gave in the sale of our old house. Gail went above and beyond to get our sale through quickly. Thanks a lot for your fantastic job, well done and hope to have more business with you. Very good service, quick - in within ~5 weeks. All staff friendly and professional. We were delighted at how smoothly and quickly our home-move happened. Thank you! We will be recommending your firm to our friends! Thanks Lorraine, We're in!! Thank you so much for everything. You've been fantastic. Outstanding and personalised service. It was a pleasure to deal with them. Kit and I would like to thank you for your exceptional work on the sale and purchase of my new home. The case was complex and you worked thoroughly and tirelessly to ensure the sale went through. Dear Gail, Would just like to say a massive Thank-you for all your help ( from yourself and your team) for getting me moved into my new flat. Excellent communication and everything ran as smoothly as I could of asked for. Will fully recommend your selves. Just completed the sale of my house and it was such an effortless experience. Lorraine has been fantastic and the whole process wasn't stressful in the slightest. I should have trusted my instinct and used Amanda and her team from the outset. Thank You!!! Keep up with everything that is happening at Geoffrey Lurie Solicitors and also the latest law related news. Beginning of the end for leasehold properties? Q. Why Do I Need a Will? A. If you die without having made a Will, the intestacy rules apply…. 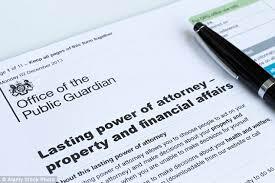 Lasting Power of Attorney for Your Business?